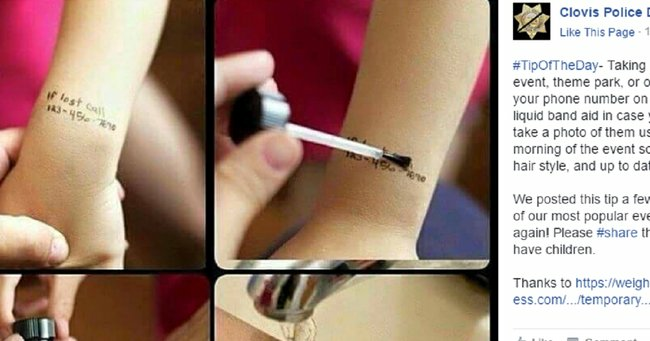 The most helpful tip for parents from police. My children are cursed with a hellish surname. Gagnon. Even if you can work out how to say it correctly, there’s no guarantee you would be able to spell it. I live with a touch of fear in the back of my mind every time we go out. What if one of the kids gets lost? Even if they tell someone what their name is, would that someone know how to spell it? Would they be able to work out how to find us? I’ve gotten around it by teaching my son to spell his name. He can recite it on demand now and the weight has lifted a little. My daughter, on the other hand, is still to young, she’ll be too young to do that for a couple of years and so I’m still living with that touch of fear in the back of my mind. A Californian police department has shared a great idea on their Facebook page. They recommend you write your phone number on your child’s wrist and cover it with liquid band aid in case you get separated. The liquid band aid stops the ink from washing away. That way, if your child get’s lost or left behind there’s a quick and easy way for someone to get in touch with you and let you know where your child is. They also recommend taking a photo of your child on your mobile before you head out so you’ve got an up to date photo of them, and you have a record of what they’re wearing. This will help authorities track down your lost little one. The chances that something, the worst nightmare of any parent I grant you, will go wrong are low. My guess is that my kids are most likely to be distracted by a cake shop and absent-mindedly wander away while I’m not looking. But being prepared for any eventuality is definitely worth it. WATCH: What do parents do after the kids go to bed?